To be honest this film was not on any of my lists to go see, not that it didn’t look like a good film just that nothing in the trailer attracted me to go and see it. It looked like another try hard rubbish comedy. When it came out however it started getting quite a bit of attention. People like Russell Brand were tweeting saying how good it was. Total film and Empire were saying very good things about it. So that got my interest more as I had not long ago been through this series of events with The King’s speech were I thought it was going to have nothing to appeal to me, how ever I was wrong about that and wrong about Bridesmaids.Less then 5 minutes in I was already in a fit of hysterics. How wrong I was. Bridesmaids is about a woman about to get married and chooses her best friend as her lead Bridesmaid, this is a woman who she known her entire life. She also chooses another Bridesmaid, this is a woman who she has only met 6 months ago. This film goes on to show the two bridesmaids trying to best eachother who will win the battle of bridesmaids.The film stars Kristen Wiig, Maya Rudolph, Rose Byrne and is directed by Paul Feig. The performances in this film were great and Kristen Wiig in particular drew my eye as her comic timing and performance was easily the best. Rose Byrne was also very good and a complete change of character for her since X-men First Class. Despite having a very small role in the film , John Hamm was excellent. Here is a man who is making it to the top and has appeared in a number of films with small roles but each small role he does is fantastic. In this he plays the arrogant idiot of the Wiig’s character. He is funny and great. I know it was not filmed with the same scenario but I could not help feel that this was the female comeback to The Hangover. Yes admittedly is not the same context, other then a group of friends and there involving a wedding. For the first half of the film i’t extremely funny and clever. Some of the scenes and scenarious are both cring worthy and hilarious. The most cringe worthy scene is when they are looking at the dresses and due to eating some bad food start feeling quite ill. I shall leave that there as I don’t wish to give much more away.One of the funniest scenes in the film is on the plane, this entails Wiig getting very drunk and the effects are brilliant to watch. The only problem I had with this film is for me it ran out of steam too soon. To put it into a metaphor, it felt like a runner having a great start but being too cocky, yes he is miles in front and feels good however half way through the race he starts to become slow. He can feel the pain of the running and the tiredness and knows he must relax and rest for a bit before finally coming back towards the end winning the race. This film is like that, it puts so much effort into the first hour which is brilliant, funny and entertaining and then seems to become slow and exhausted half way through. Yes this is to go with the downward spiral that our lead woman’s life seems to be going down. It become gloomy and depressing like most films must go through that downward stage until it gets picked back up. However for me this downward spiral is far too long, it needed to be shorter that way when it rises up again its even better. This just felt like it ran out of steam half way through and used it best stuff too soon. Another scene which I found entraining is when Wiig’s character is attempting to gain the attention of the police officer by breaking every motorway code. *** This is a very funny film with some great performances however it runs out of energy too soon and is almost left in this miserable state depression. When the characters are on the down low it needs to be much shorter then it is. I am a fan of this series, there’s no denying that. I’ve enjoyed them all baring Tokyo Drift though that’s not a reflection on the film more my inability to cope with the lead guy’s annoying accent. This lastest installment is my favourite so far. Fast five is the latest in the fast and furious series of films where you have a film about cars, racing and girls. This time the boys and girls have headed to Rio in order to rob the richest man there of all his money and ultimately buy their freedom. It has a collection of actors from all there pervious films as it was supposed to be felt as Mr Diesel puts it “One last job”. Its main acts are Paul Walker and Vin Diesel who lead the gang to Rio. Its directed by Justin Lin. Now people criticize these films because, they have awful plots or why do I want to watch people drive around for two hours. I am not one of those people. I thoroughly enjoyed this installment and believe it is the best so far. It’s easily the most fun, the biggest and the craziest so far. Yes like many works of art it has flaws and no this film cannot be taken too seriously and I don’t think it was ever intended to be, with any of the installments so far. This film is simply a great deal of fun to be enjoyed. From the start you are hooked as they start the film exactly where the last one left off. Getting Dom out of the bus which is heading for jail. I won’t say how they do it as I don’t wish to give spoilers away, however I will say it’s defiantly worth watching. The set is of course beautiful to behold. It’s shows Rio with all its beauty. The cars themselves are of course stylish and a beauty both to look at and to hear. I will say that they have defiantly gone up a few gears for this film as it feels as though they have put a lot more thought and effort into this one, more than the others so that you watch it feeling thrilled and entertained. physic. It’s very well done and has everything you could need from it with the two throwing each other through windows and walls and then each other. Paul Walker is excellent in this, I really enjoyed seeing both Walker and Diesel together in this film but working together. They do seem to have slightly switched roles in this, by that I mean it’s normally Diesel who gets worked up and wanting to fight while Walker is normally the peacekeeper. There are several moments when O’Connor looked as though he was going to start something and Diesel is the one to step in and calm the situation down. There are many twists and turns in this film, they all work really well and give the film a refreshing look and feel. It is however quite a hilarious sight when The Rock is standing next to his partner, played by Elsa Pataky , the size difference between the two of them is insane. The Rock being quite tall and quite hugely built next to the tiny woman. The races are all brilliant and the last one at the end when all the cops are chasing them is crazy but so so good to watch. I will say as they it is in the trailer, Dom and O’Connor attach metal ropes to the vault and pull it out of the wall using their cars. They then proceed to drive down highways and through street using the vault as a weapon to simply, smash and destroy everything in sight. It sounds over the top and extreme, which it is, but it makes very good viewing. Without giving anything away, once you have watched the main film fast forward as there is a very interesting post credits scene which is as we now know the thumbs up for another fast and furious film, which after watching this one I welcome with open arms for the next one. ***1/2. If you’re a fan of the fast and furious series then I would say defiantly go and see this one, you won’t be disappointed. This is a film like the A team, if taken seriously then yes its average. But taken as a good fun entertaining film then its brilliant and now after writing this I’m going to go and watch it again. Now I will be the first to admit that I am not a fan of Matthew Mcconaughey, really I am not. I’ve seen many of his films and he just doesn’t entice me into his roles or his films. However the one time I think where I have seen a film where he is the star of and enjoyed is “A time to kill”. Where he plays a Lawyer defending the rights of a man who is accused of having killed two men who raped his daughter. In Lincoln Lawyer he plays a Lawyer who works from the back of his car and is representing a man accused of killing a girl after a one night stand. It’s directed by Brad Furman and stars Matthew Mcconaughey, Marisa Tomei, Ryan Phillippe,William H.Macy and Josh Lucas. This film is an absolute thrill, its intense, funny and dramatic at the times it needs to be. Mcconaughey is fantastic to watch and for once when he is taking his shirt off its done in a tasteful way rather then having having him reveal more for the sake of it. This new post I can write happily, which is good as I didn’t want my blog to turn into a website for bad movies. This is not a bad movie. Yes like most films there are a few bad moments and weak points but in the whole I thoroughly enjoyed this film. Maybe as some people are thinking as they read this, it’s because I am a guy. This is true as the film is very much aimed towards guys and I would be an idiot for trying to ignore that fact. Sucker Punch is clearly not oscar material as it seems that most oscar material has to be for more than just one section of the public I.E a film which everyone wants to see other than guys. Sucker punch is about a young girl whose mother passes away and lives her and her little sister alone with the much hated step-father. After trying to kill her step-father after he nearly rapes her little sister, he mistakenly kills her little sister instead. Woops. From here she is sent a mental institution where she meets other girls. The home is a front for a dancing club run by the creepy but well played Mr Blue. From this point the girls team up together and try to escape. It’s directed by Directed by Zack Snyder. With Emily Browning, Vanessa Hudgens, Abbie Cornish, Jena Malone. Now when I write the Zack Snyder your mind should, hopefully, be filled with a view that this film will have dazzling special effects and music as well as being very stylised to the man who brought us things like 300 and Watchmen. Sucker Punch does not fail. From the beginning of the film you are brought to such awe inspiring way of filming with the slow motion captions to the comic book feel cinematography. Like Watchmen and 300 this film simply put is beautiful to look at. When it comes to the vision of a film it is hard to beat ZackSnyder’s efforts into putting a film like this together. Its beautiful elegant and yet at the same time highlights the gritty dirt of the story line and of real life so that you are both left wanting more and shown disgust at some moments of the story line. Zack Snyder has been very clever by using what I like to call the “Snyder Touch” this is to say that once you start watch a film like this, you know instantly who made it. I myself did not enjoy Watchmen greatly as far as the plot is concerned and yet looking at purely from a visual perspective it should be held on the podium very high indeed. Sucker Punch is the same, its technology is breathtaking, in fact I am far more impressed by how Zack Snyder’s films look then how films such as Avatar look. As far as the music is concerned I can find no fault in it, from the lines “sweet dreams are made of these, who am I to disagree” to the music at the ending credits. The music suites this film perfectly and is done so very well. There are moments when you both hear and see something which make the hairs on the back of your neck stand on end as you know you are watch something special, amazing, so well done. There is one scene that sticks out for me as far as timing and music is concerned. That is the scene where the Russian dance teacher insists that BabyDoll (can you see what I mean that this is clearly directed for guys) dances for the first time, when she puts on the music to that one song and BabyDoll started dancing and you watching it can help but nod your head to the beauty and beat of the music. That scene worked just so so well for me. The song incidentally is Army of me and can be found on iTunes and Spotify. Now the film I don’t think will get much attention at the Oscars but this music should be noticed. Now the characters, like all films, some were very good and some average and some just didn’t live up to scratch. Mr Blue played by Oscar Isaac was very well played indeed. He plays the man in charge of all the girls and is the owner of the entire place. At first he is seen to be the man who will look after the girls and help them on their way, quickly this changes into how much money he can make from the girls. He is nearly driven insane but he is a definite high light of the film. He can be both charming in the crudest sense and creepy beyond words. Heis forceful and does what he wants. I look forward to seeing him play other roles as I now know he can play this role very well. His relationship with Carla Gugino’s charactor Dr. Vera Gorski is fabulous as its intense and clear that they have a past together. She tries her very best to stand up to him for the girls and it is clear that though she has to be harsh on the girls she has a great love for them all. I feel that these two characters and their relationship far out way any others on screen, not to say that the rest are bad just that this relationship is particularly good. Now some people say that this film is not good simply because is shows girls not wearing much, showing too much cleavage and too short of skirts. I would agree that the film does show this, however after ten minutes I did not pay much attention to this as you get lost in the action of it all. Also may I remind you all that this film is set in the 1960s. What grabbed me as a clever concept is that the dance for the girls was a form of escapism which lead them to any world which they wished to go to from their own minds. Now some will argue that the reason that the worlds they went to were full of desecration and what looked to be an end of the world scenario. I would argue that it was this way because it is a reflection of the girls state of mind. They are fighting for their lives as they are mentally losing themselves, the cities are crumpling around them because it’s a reflection of their own state of mind. Admittedly it is also a good place for a massive action fight. I found that the dance to be the way of escaping to be a very clever idea. With Babydoll, it worked for me as a character and yet there were some scenes where looking at her face for reaction, I saw nothing there which was a slight disappointment as her acting skills clearly weren’t quite good enough and no i’m not refereeing to the end of the film. The same im afraid goes to Vennesa Hudgens character who I just didn’t believe as a character. Abi Cornish was very strong and very impressive in this and you could feel every emotion she was going through, the strong leader, the loving sister and the fighter. One comment I must make which nearly ruined the film for me was the scene near the end. (spoiler alert) when Babydoll must sacrifice herself to allow Abi Cornish’s character to escape. This scene I don’t think was needed and was far to much, nearly ruined the entire film for me. One last thing, when they show Babydoll’s face for the last time, as the camera moved around the room. I’lll admit I was slight sacred to see her face however when I did it was a disappointment. *** It’s a good film to goand see, with some very good performances, though defiantly a guy film. A three very much bordering on a four star. I really do wish that I was starting off my blog with a big bang of a film. The kind of film everyone wants to see and everyone who comes out of it is happy with and wants to see again. 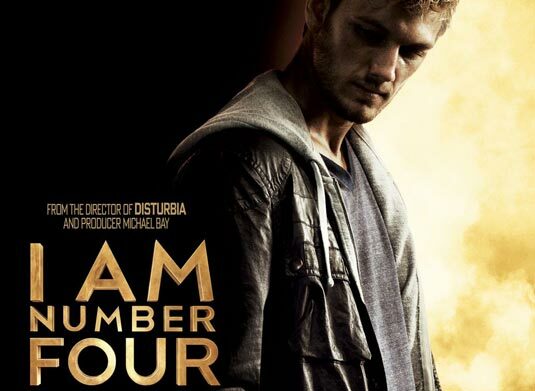 However due to simply bad timing, the last film I saw was I Am Number Four. This is a the film about Number Four, a man who is from another planet and is forced to escape his planet and come to Earth. He is looked after by a guardian who is also from his planet Lorien. Number Four is not alone and has come to Earth with a group of aliens, the main premise of this film is that a group of what apear to be hunters from the same planet are after the number to kill them. The film is directed by D.J. Caruso and stars Alex Pettyfer, Timothy Olyphant, Dianna Agron, Teresa Palmer. This seems like a fairly good premise if done right, and I had trust, note the had trust, in D.J. Caruso talents as a director. I mean look at Disturbia, that’s one I really enjoyed and had the pleasure of watching time and time again. I feel though that Mr Caruso may have left that little thing behind which makes a film good. Though every Actor and Director alike is allowed to make some mistakes here and there. This film is exactly that. Ill be honest unlike many people I knew, I was slightly looking forward to seeing this after seeing the trailers for this film. However I am here to say this is not a good film. The script well , its one the films weakest points. Never has there been a less original script. It feels like someone has forgotten how to write a script and said “Hey everyone i’m just popping down to the Film archive and getting the book with have filled with film clichés anyone object” to which everyone should have screamed yes, but they didn’t the script was poor and the film suffered horribly because it. The script I feel for any film is a foundation of the piece. You could have the best actors, directors and set , yet if you have a bad script the whole thing falls down through the ground. The cast, well the cast I have mixed feeling on. Yes girls in their many hundreds will go to see this film because of the main lead Alex Pettyfer who they all say is good looking and will be happy with the scenes where he takes his shirt off, but for the rest of us looking at his talent he is not good in this film. Which is a huge shame as I have seen him in films such a “Tormented” and he was really fantastic in that, however he lacks any really talent in this. Yes he has a few scenes where he does well, however most of the time for me it felt like I was watching some one struggle to break through that wall into better acting. Hes almost there and yet he can’t quite get through. So overall it was a struggle of a performance for him and he joins the bin with the director on this one. It was just a long frustrating moment for him on a lot of his lines, as though you really wanted him to get through this and be good but he just didn’t ever manage it. Dianna Agron I did enjoy very much in this film, she was one of the highlights for me. She easily out classed Mr Pettyfer. I just wish she had had more screen time, I do hope she goes onto much better things as she can easily manage it. The way she held herself was very impressive, I look forward to see how she holds her own against bigger and more impressive names. Timothy Olyphant was another who can stand on the podium and be proud of his performance, he really did capture the screen when he was there, maybe it was due to the amount of experience he has had but again I did enjoy his role in this and just wished that he had had more time on screen. Here is a man who deserves a big break. Now I could complain about this film all day , from the boring flips and dives from Number four as he discovers his powers, which in todays standards is just boring and poor effort. The hunters where very cool to looking at and the make up is done very well. Again here is another actor who deserves his big break, Kevin Durand. I found him very good in his role of the leader of the hunters, to the point where I was wishing he would be on screen more. The most scary thing about this film is the aspect that there may be another one. God help us all. *** It’s a very easy watch as it’s so simple, as mentioned above , there are a few actors who stand out. If your feeling really really bored and having nothing to do then watch it, your girlfriend may some what enjoy it, guys you will not. The only pushing it to three stars is due to certain performances, other then that its a two.